Let me start this review with the opening line of the book – I am not my husband’s wife, nor my child’s mother. Who, then, am I? 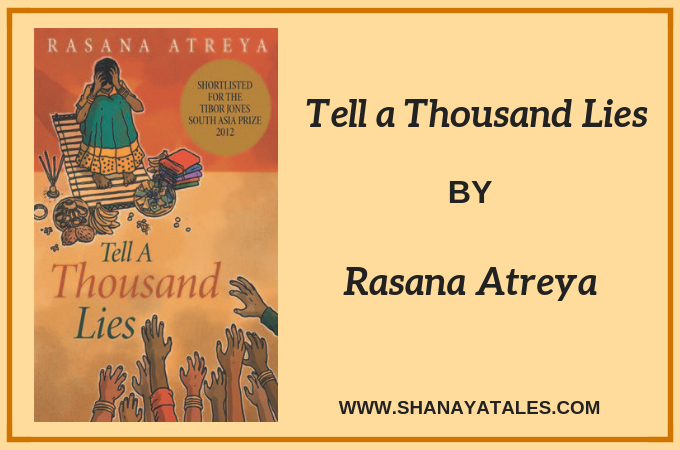 Set in 1986, in Mallepalli, a tiny village in Andhra Pradesh, Tell a Thousand Lies follows the lives of a pair of fraternal twins – Pullama and Lata. Dark skinned Pullama’s only ambition in life is to become a good wife, while fair skinned Lata, would rather study medicine than get married. Why am I mentioning the skin colour while introducing the protagonists? Well, because this tale is set in a time and place, where the color of one’s skin, determines one’s destiny. The story begins at bride viewing ceremony of Malli, the older, more placid sister of the twins. With three girls in the family, brought up by an old grandmother, whose main priority is to marry them off, this is an extremely important event for the household. Lata has been sent away to a far off relatives place, so that her good looks don’t distract the potential groom from considering her sister. But Pullamma, being dark-skinned and tall, and therefore not attractive by the standards of her corner of rural India, is allowed to stay. What follows next, is a sometimes wry, sometimes heartbreaking, but always intriguing tale of a woman finding her identity, strength, and voice, in a culture that is trying to reconcile the superstitions of the past with the modern world. I must mention that the narration hooked me from the very first page. What I found striking was the way Pullama narrates her story, the circumstances, and all the terrible things being said and done to her, in a calm, matter of fact way. She doesn’t play victim, nor does she indulge in self-pity. She just gives you a very clear and honest depiction of her reality. A whole gamut of human relations and their intricacies are dealt with beautifully. However, at the very heart of this book, there is a tale of deep, unadulterated love. Not necessarily the kind of love that is glorified in romance novels, but the kind that you have seen, heard of, or experienced in your daily life. The kind of love that isn’t always about grand romantic gestures, but is reflected in the simple acts of affection on a day-to-day basis. This book also made me reflect on the universality of human emotions. I don’t live in the time and age that Pullama lived. She comes from an extremely rural part of India, while I grew up in the metropolitan Mumbai, almost 20 years after her time. Yet, I could relate with some of her innermost feelings and desires. Also, while this book deals with a wide range of issues like racism, politics, deception, violence; it is essentially a tale of courage, determination, deep love, and the indomitable nature of the human spirit. There were times when I felt the story turned overly dramatic, and dragged on a bit; but all in all, this book has the right ingredients – a well written plot, a relatable cast, a heroine to cheer for, and enough twists and turns to keep the reader anxiously turning pages. For a debut novel, this one was very well done. I will certainly check out more from the author. I have liked several quotes/lines from this book, but most of them are contextual, and will give the story away, so I resisted the urge to share them here. However, I couldn’t help sharing this one. This line kind of stayed with me. But life isn’t a fairy tale which ends in happily ever after just because the last line of the story is written. Hurts have to heal, resentments have to fade, trusts have to mend. But I see hope for us. This book was not a conventional pick for me. I decided to read it on a whim, and I clearly wasn’t expecting to like it as much as I did. It has made me rethink my book selection process. Have you experienced something similar? Have you picked a book on an impulse, and found it totally unputdownable? 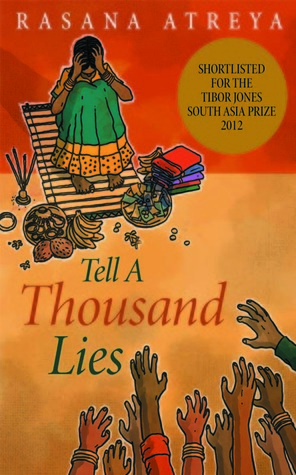 Disclaimer: Reviewed as part of The India Readathon. I have picked books exactly the way you described and was pleasantly surprised. It’s always interesting to read about women trapped by culture and circumstances who find ways to be brave and endure, often rising about what should be possible. This book sounds very interesting. Sounds like a fairly intriguing premise and yes, even I was thinking of Roja before you mentioned it. Very well written review. You piqued my interest. Paulo Coelho’s The Alchemist was one of my unputdownable books. Sounds good. This book is on my wish list. Hope I am able to read it soon! I’m a bit lost here – it’s a story of twins Pullama and Lata, so who’s Malli? They were three sisters? Malli was one of the twins? The book does sound interesting. I find myself perpetually hopping across to Amazon these days. Too many books to read. Malli is the older sister of the twins. There are 3 girls in all. However, the twins are the protagonists. It is a pretty interesting, fast paced read. Great reviewing! My TBR list is full of ur suggested reads. What an interesting story! It’s definitely outside my usual reading realm, but I might have to give it a try. Sounds an interesting story. Would love to read. Nicely reviewed.